I live in some kind of weird pizza zone where no less than 12 different pizza places vie for my business. They all have their various ways of reeling me in - Perfect Pizza's manager writes to me like we're actually friends or something; Pizza GoGo offer me the joy that is Punky ice cream; Domino's tempt me with free brownies; Papa John's just want to give me a heart attack (I swear they deep-fry the bases) and so on and so forth. 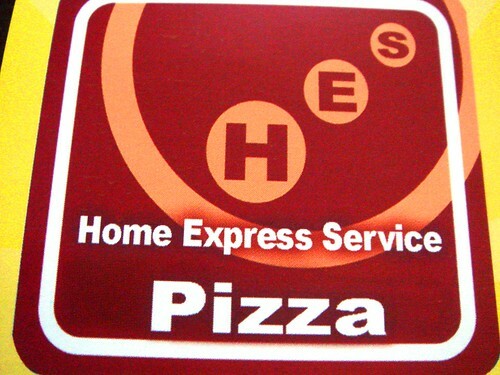 Home Express Pizza for the win however, with their latest tactic to increase their custom. 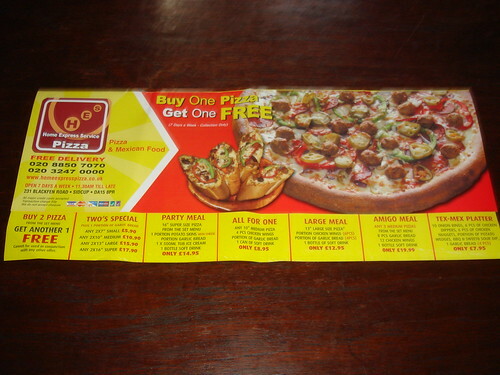 Here's the menu for Home Express Pizza or HES for short - looks normal, right? Bog standard even, with it's "Buy One Get One Free", yadda yadda yadda. 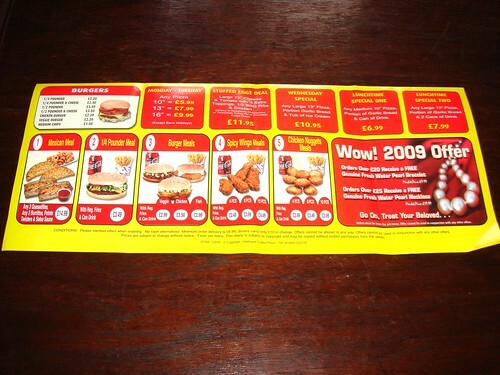 Let's turn the menu over and look at the other side now. Scanning from left to right, it's still business as usual. Dodgy burgers, chicken wings, nuggets - but WAIT! What is this? Something about a Wow! 2009 Offer. So how wow is Wow!? Orders over £20 Receive a FREE Genuine Fresh Water Pearl Bracelet! Orders over £25 Receive a FREE Genuine Fresh Water Pearl Necklace! It's no joke - their website confirms this glorious special offer which seems to be available throughout the whole of 2009! "Right lads, we're in a recession right now, so we need to stop people scrimping and saving and somehow lure them back into stuffing their gobs with expensive cheesy goodness. 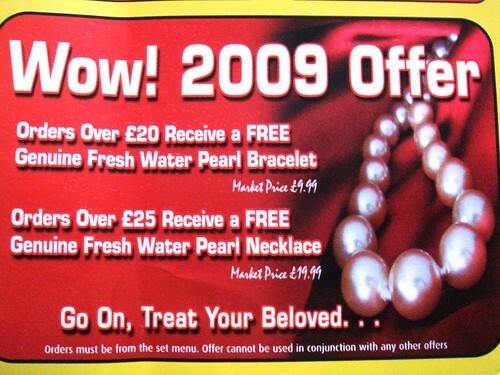 We've tried BOGOFs, we've tried Haagen Dazs, so let's go for the ultimate - free jewellery!" So how many pearl necklaces do you think I can get before I start to pee them off? Hope you don't mind me linking to it - I Googled for ages and couldn't find anything about Punky apart from your supercute flickr photo! ps I've never seen the cow before - what's he called? The cow is called Vacky. There is also a Martian called Martin although I've not had him yet. There is a photo of Vacky alone on my photo stream. This is too too funny! I want to get one just so I can proudly tell people where I got it from when they ask. I wonder what they will come up with next? A diamond ring with every portion of super-stuffed-crust-lard-infused onion rings perchance? D'you remember when Pepsi offered a free Harrier jumpjet?